Sections of Scotland's sea bed are to be leased to developers who want to generate electricity from the tides, BBC Scotland understands. The Crown Estate, which owns the sea bed, is expected to begin the leasing process within weeks. A quarter of Europe's marine energy potential is believed to lie around Scotland's shores. But it has proved difficult to install the heavy engineering in places where there are powerful and dangerous tides. It is hoped one gigawatt of marine power will be delivered to the national grid by 2020 as part of the UK's renewable energy strategy. Gareth Davies, who runs consultancy firm Aquaterra, said beginning the leasing process as soon as possible was crucial if that aspiration was to be met. He said: "Although 2020 may seem a long way off, if we want to actually get that power into the grid by that time we really need a leasing process now so that people can start making applications for areas of sea bed where their technology can be deployed. "There are plans under way for a leasing round to be announced by the Crown Estate and we are hoping that will happen in the near future." Several developers are attempting to create technology which will allow them to harness the awesome power of the Pentland Firth, which runs between Orkney and the Scottish mainland. 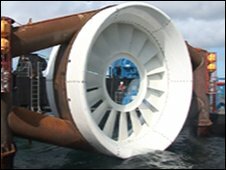 Among them is Irish company OpenHydro, which has constructed what it believed was the first barge custom-built to lower generators onto the sea bed. They are currently testing it on Orkney in a bid to prove it will work in even the most powerful currents. Chief Executive James Ives said he believed a commercial tidal farm could be operating off Scotland within two years. He added: "We will actually be taking this barge out in the next couple of days and lowering this base directly on the sea bed. "It will be a world first. It is the first barge specifically designed for this operation and it will be the first time a turbine has been deployed in this way. "We feel that we have a fantastic turbine technology that has already proven itself by being the first to run on a national grid, and we are about to demonstrate that we can deploy turbines on the sea bed. "These are fundamental steps towards us meeting our objectives of building farms of tidal turbines. It is very near, and it is very real." 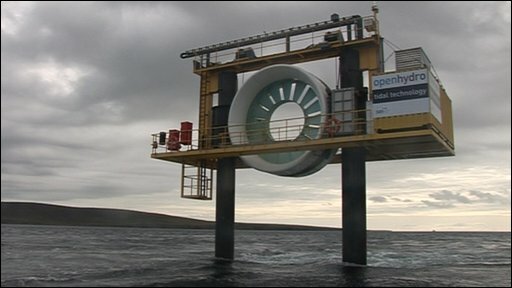 The technology is being tested at the European Marine Energy Centre, which is based on Orkney. But Neil Kermode, the centre's chief executive, is concerned people are pushing too hard to get tidal generation into the Pentland Firth. He said the firth was a very powerful and dangerous piece of water that could easily wreck a tidal generator, and with it the hopes of a whole industry. Mr Kermode added: "I think caution is very sensible. The Pentland Firth is absolutely the jewel in the crown and I think we need to make sure that we go there when we are ready. "I think people are getting ready, but I don't think anybody could say they are ready right now, mainly because there are so many things to learn. "I would like to see a lot more machines before we go out and deploy this industry on an industrial scale."